Our cool, cotton crochet miniskirt with flirty ruffled edgings makes a cute swimsuit cover-up. The coordinating crochet beach bag is roomy enough to hold all your carry-along essentials. 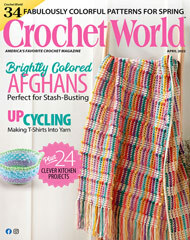 This crochet pattern was originally published in the July 2010 issue of Crochet! magazine. Size: Miniskirt: Includes women's X-small through X-large. Crochet Beach Bag: 17" x 15", excluding handles. Miniskirt made with size 3 crochet cotton thread and size E (3.5mm) hook. Beach Bag made with medium (worsted) weight yarn and sizes H (5mm) and K (6.5mm) hooks.